Thank you to everyone who attended Altimeter Group’s webinar on Tuesday, “The Inevitability of a Mobile-Only Customer Experience.” Brian and I were thrilled and grateful to see people joining from around the world, ready to engage with us while we shared insights from our latest report on how companies are approaching customer-centric mobile strategy design. If you missed the webinar, or want to rewatch it, you can view the recording and slides here. At the webinar’s close, we were able to answer a few questions from the audience, but didn’t have quite enough time to get to all the queries that came in throughout the presentation. You can find additional answers to the most popular question themes below. Please leave a comment if your question remains unanswered, and we’ll reach out as soon as we can. 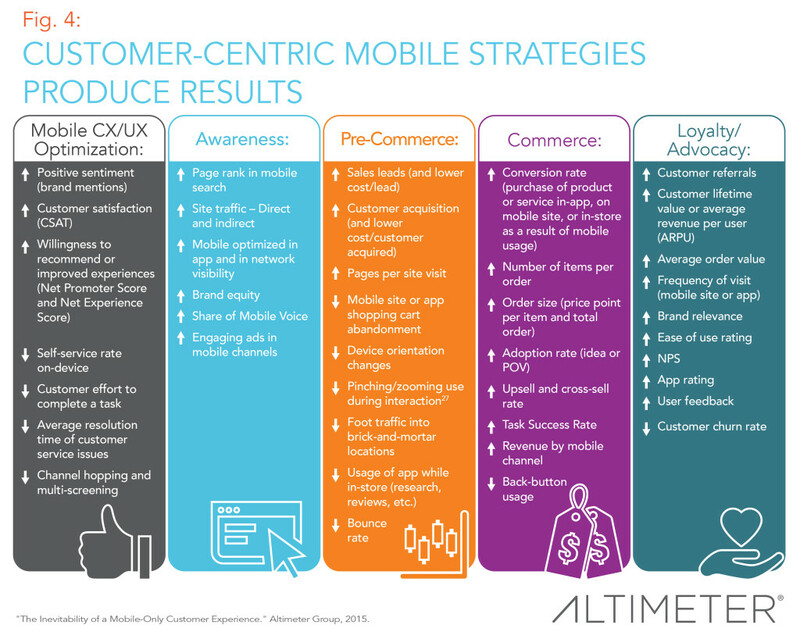 What are the advantages of disadvantages of a mobile-only customer experience? Advantages of a mobile-only customer experience are plenty. In our research, we found that, when companies focus on creating self-contained mobile experiences that center on customer needs, wants, pain points, and expectations, they’re rewarded with greater customer satisfaction. This increased satisfaction translates into higher Net Promoter Score (willingness to recommend), higher lifetime customer value, and lower customer churn rate. Additional benefits can be found in the figure below. Looking at the disadvantages, the chief drawback of creating a mobile-only customer experience is that many consumers have already learned that they need to use multiple channels to convert or complete an action. It is now an ingrained behavior that will take time (and, initially, additional resources) to change. Most companies unwittingly teach their customers that mobile is only part of the experience loop when they force channel-hopping and multi-screening. Eventually, these customers will recognize that they can again follow their mobile instincts and rely on one device, app, or mobile-optimized site to complete their entire journey. At that point, less resources will need to be spent on optimizing a cross-channel experience. Is a multi-screen strategy still relevant for certain applications? The short answer is, yes. Even customers who live a chiefly mobile lifestyle will undoubtedly need to switch between screens for reasons that can include context of engagement (e.g. when driving, it’s safer to use your vehicle’s “mobile” technology than look at your cellphone), screen size needs (e.g. it’s easier to edit photos on a laptop due to more screen space and greater mouse dexterity), or even portability (e.g. it’s more convenient to switch from your iPad to iPhone when going out to run errands). Companies should strive to create mobile-only experiences with the hopes that, in the process, they’ll end up with more intuitive, native experiences on each device that offer simplicity in navigation and robustness in feature set. How do you see customer demographics, like age, affecting mobile strategy design? Customer data is the key to unlocking how to design the most innovative, engaging mobile experiences. Although younger generations (aka “digital natives”) are statistically more apt to use their mobile devices throughout the day, more often, to complete more tasks, that doesn’t mean that older demographics should be ignored when designing and redesigning mobile experiences. Spend time learning about your customers through digging into the data: their purchase decisions, lifestyle studies, brand interactions, and mobile and digital channel behaviors. Use the questions below as an initial guide (additional examples from companies interviewed can be found in the report). From there, you’ll see that multiple personas with varying demographics would benefit from a more complete mobile experience. What touchpoints do they frequent during formulation, pre-commerce, commerce, and post-commerce? How often, and for how long? How do they use each touchpoint during the purchase decision cycle (what action is completed at each step)? What devices are used to take the customer from awareness through advocacy? What are companies doing to capture and build customer information based on interactions from mobile devices? In our research, we uncovered that brands most often incorporate mobile customer data in two ways: known customers (via unique ID, like a loyalty program or other login) and unknown (those who are unidentifiable). For both categories, data such as mobile usage, engagement, time on app or mobile site, etc., are easily accessible data points that can be tied to each step of the ideal mobile experience. For known customers, brands are beginning to identify at what point during the purchase decision cycle customers use mobile, when they jump to another channel, and when/where they eventually convert to purchase. This information is key to support why each step of the ideal mobile experience is critical to keep customers on-channel and contained throughout brand engagement.